﻿ Riad Aliya Marrakech. JIMAT di Agoda.com! Riad Aliya berjarak hanya 1 minit berjalan kaki dari Makam Saadia dan 500 meter dari Istana Diraja. Ia menawarkan kolam renang di halaman dalaman, teres atas bumbung dan sarapan tradisional. Bilik-bilik dan suite-suite di Riad Aliya terletak di sekitar halaman tengah dan dihiasi dengan gaya kontemporari. Setiap unit mempunyai ruang tempat duduk, penghawa dingin dan akses WiFi percuma. Tuan rumah boleh menyediakan makanan Maghribi untuk makan siang dan makan malam jika anda memesan terlebih dahulu. Penginapan ini juga boleh mengaturkan untuk anda menjamu selera di Chez Ali Restaurant dan menonton pertunjukan fantasia. Kakitangan di kaunter penerimaan tetamu 24 jam juga boleh mengatur aktiviti menunggang unta, pemindahan lapangan terbang dan sewaan skuter. Hammam dan urutan disediakan dengan bayaran tambahan. Riad terletak dalam jarak 15 minit berjalan kaki dari Dataran Jamaâ el Fna dan 10 minit memandu dari Lapangan Terbang Marrakesh-Menara. This riad had a fresh take on things. It still looked like a riad, but it did not have the usual mosaics we saw at other riads. It was different yet still the familiar riad set up. The pool at the courtyard was always a nive view from our room. If you just want to sit back and read a book you can comfortable do it by the pool side or at the cabana/couches at the roof deck. The staff were very friendly and very accommodating. Food was great as well. You just have to inform them beforehand that you will stay in for dinner so they can go to the market to prepare the food. The 3 very helpful Girls of the Riad were amazingly helpful and nice, all spoke good English and French. The rooms were very nicely decorated, modern marrocan. Would definitely stay here again when visiting Marrakesch. Its about 10 Minuten walking from Jameen al Fna. Nice terrace to relax after a crazy day walking around souks. A Genuine Riad, Good English, Beer! We really enjoyed the traditional experience here. The neighborhood is ancient! Your driver will help you find the Riad. 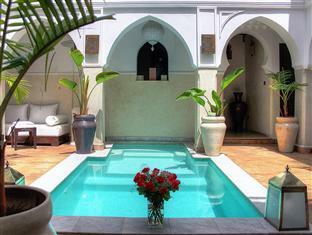 It is a short walk to the Saadian Tombs and a long walk to the main square. superb. the ryad is simple , cosy and very clean. 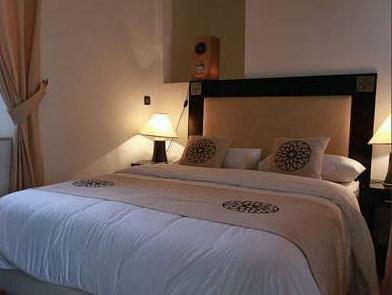 the staff is very caring and friendly and we enjoyed at best our stay. location are excellent, food are sooooo good, staffs are very nive and friendly, cant ask for more ! the place to be ! Very quiet and relaxing super clean and affordable! From arrival to departure everything was great. the decorations, the style, the extra little touches...really appreciated every minute. Thanks also for taking care of finding a good doctor! If there is anything...maybe breakfast could have a bit more variety but still enjoyed it! We spent a great 2 nights at the start of our holiday around Morocco at Riad Aliya. We were a little apprehensive about making a final choice as there are so many Riads to choose from, but this was our haven in the madness of Marrakech. The service provided by Hannah and her friendly team was brilliant.The rooms were spotlessly clean, bright, modern and extremely comfortable. The bathrooms provided toiletries and fresh towels and bath robes each day. Breakfast was included in the price and was of a good standard - freshly baked selection of Moroccan breads with tea, coffee and freshly squeezed orange juice. Mid way through our trip around Moroccoh we had to return to Marrakech unexpectedly due to unforseen circumstances. Having no reservation in the city we made our way back to Aliya where we were welcomed back to into the Riad. Much to our disappointment they were fully booked, but despite this, they rang around other contacts and allowed us to use their internet in order to find a place to stay. We were so impressed by their genuine kindness and generosity that we stayed at the Riad again at the end of our holiday. It very much felt like a home away from home. The Riad is one of the few places that serves alcohol - so this is a real bonus in a relatively 'dry' country. We couldn't have asked for a better stay. Sehr freundliches und hilfsbereites Personal. Wurden sehr herzlich empfangen und fühlten uns wohl in der ruhigen Umgebung. Caroline gab uns wichtige Informationen mit auf den Weg und organisierte auch unkompliziert Ausflüge, Hammam und Mietwagen. haben uns sehr wohl gefühlt ,das Riad ist mitten in der Kasbah doch vom Trubel bekommt man nichts mit. Zimmer und Gestaltung des Riads sind sehr geschmackvoll. 사진 처럼 예쁘고 사랑스런 호텔이였지만, 장소를 찾는데 1시간 이상이 소요 됐고 아고다에 기재 돼 있는 번호로는 전화 조차 되질 않았다. 마라케쉬를 뺑뺑 돌면서 주변 사람들에게 질문을 하고 또 하고 찾아갔는데, 그 앞에는 뭔가 어두워 보이는 한 무리의 모로코 남자들... 담배를 피고 말을 걸고 웃고 떠들고; 밤 11시쯤 도착했는데 어두운 골목 한 켠에서 그러고 있으니.. 찾는데도 시간이 오래 걸렸는데 들어갈때 기분이 썩 좋지 않았다. 여자들끼리는 비추... 안에 들어 가 보니 와이파이도 잘 되고 친절한 주인과 아름다운 인테리어가 마음에 쏙 들었으나 조금은 쌀쌀했고.. 문을 잠구는 시설이 따로 없어서 밖에 나갈때는 그냥 열어 두고 갔는데.. 마음이 불안했다. 샤워 시설이 나름 괜찮았으니 쇠로 된 시설이 많아서 그네나 철봉을 한 듯 손에 냄새가 배겼고.. 샤워실 안에는 불도 안 켜 지고.. 물도 안 빠져서.. 고생스러웠다.. 신랑은 키가 185인데 샤워 부스가 작아서 서 있기도 좀 힘들었다. 조식은 1층에서만 가능 했고 모로코에서 흔하게 구할 수 있는 올리브 오일 조차 제공이 안 돼서 조금은 아쉬웠다.. Le séjour a été merveilleux, l'accueil irréprochable et le personnel très serviable. Nous avons passé un agréable moment en toute discrétion avec une responsable très attentionnée et disponible ! c'est certain le prochain voyage à marrackech sera de nouveau dans ce fabuleux riad aliya ! merci à toute l'équipe qui travail au riad jour et nuit afin de nous satisfaire dans nos moindren désirn... merci à hayate, notre "gouvernante" durant le séjour, elle a été au petit soin avec nous. personnel de grande catégorie avec toujours le sourir pour nous servir et nous faire découvrir la ville. tout était sublime ! le petit déjeuner (nous cale pour toute la journée) café, lait, pain maison, confiture au choix, miel, crèpe...un régal ! riad de haute qualite. mille merci à tous pour cette convivialité incroyable, nous nous sentions comme chez nous. incroyable la chambre est refaite à chaque fois que nous la quittons/retrouvons. le linge de toilette est fourni et est changé tous les jours !! nous le conseillons très fortement ! d'autant plus qu'il est à 10 minutes à pied de la fameuse place jema el fna ! Zdecydowanie polecam ten niewielki hotelik z bardzo przyjazną obsługą i dogodną lokalizacją.